Unit: 737th Explosive Ordnance Detachment, 52nd Ordnance Group, Fort Belvoir, Va.
Sgt. 1st Class Smith of Punxsutawney, Pa., graduated from Jeff Tech and Punxsutawney Area High School in 1990, joining the U.S. Army in January 1991. Since that time, he served in Alabama, Arkansas, Italy, Maryland, Florida, Washington, New Jersey, Alaska, Virginia, Afghanistan, Kuwait and five tours in Iraq, specializing in law enforcement and explosive ordnance disposal. He was instrumental in the development and testing of new weapons systems and ordnance, including the SWORDS program. He earned many awards and medals during his years of service, including the Meritorious Service Medal; Army Commendation Medal; the Joint Service Achievement Medal; Army Achievement Medal; Army Superior Unit award; Army Good Conduct Medal; National Defense Service Medal; NCO Professional Development Ribbon; Army Service Ribbon; Overseas Service Ribbon; Outstanding Volunteer Service Medal; Iraqi Campaign Medal; Global War on Terrorism Expeditionary Medal; Global War on Terrorism Service Medal; and the Master Explosive Ordnance Disposal badge. In July 2007 Picatinny Arsenal has honored Sgt. 1st Class Smith by placing his name on the military building here where he used to work. He died of injuries sustained when an improvised explosive device detonated during a controlled ordnance clearing mission in Iskandariyah, Iraq at age 34. _Sgt. 1st Class Smith of Punxsutawney, Pa., graduated from Jeff Tech and Punxsutawney Area High School in 1990, joining the U.S. Army in January 1991. Since that time, he served in Alabama, Arkansas, Italy, Maryland, Florida, Washington, New Jersey, Alaska, Virginia, Afghanistan, Kuwait and five tours in Iraq, specializing in law enforcement and explosive ordnance disposal. He was instrumental in the development and testing of new weapons systems and ordnance, including the SWORDS program. He earned many awards and medals during his years of service, including the Meritorious Service Medal; Army Commendation Medal; the Joint Service Achievement Medal; Army Achievement Medal; Army Superior Unit award; Army Good Conduct Medal; National Defense Service Medal; NCO Professional Development Ribbon; Army Service Ribbon; Overseas Service Ribbon; Outstanding Volunteer Service Medal; Iraqi Campaign Medal; Global War on Terrorism Expeditionary Medal; Global War on Terrorism Service Medal; and the Master Explosive Ordnance Disposal badge. In July 2007 Picatinny Arsenal has honored Sgt. 1st Class Smith by placing his name on the military building here where he used to work. 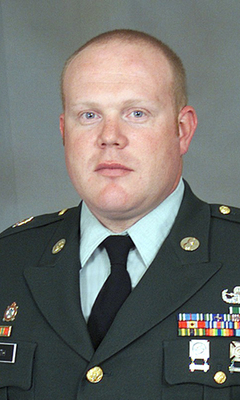 He died of injuries sustained when an improvised explosive device detonated during a controlled ordnance clearing mission in Iskandariyah, Iraq at age 34. Smith grew up in Punxsutawney, Pa., but worked for the past five years at Picatinny Arsenal in Morris County, developing methods to disarm spent weapons and designing and testing robots capable of detecting bombs or of bearing weapons themselves, said Joseph Wu, the director of Picatinny's Explosive Ordnance Disposal Technology Directorate. "He was part of a special gang of very, very bright (noncommissioned officers) that advanced the idea of armed robots," Wu said. "Now it's gone through the first iteration of development and is being urgently released to Iraq." On Monday, Smith was trying to defuse one improvised explosive device when another exploded nearby, an Army spokesman said. A law enforcement and ordnance-disposal specialist, Smith had been stationed at Picatinny from September 2000 until January. He put his experience with robotics to use after the Sept. 11, 2001, terrorist attacks. He and other soldiers from Picatinny, a weapons research and development facility, spent 10 days at the rubble-strewn World Trade Center site, directing a small camera-mounted robot that assisted in the recovery of victims, Wu said. Wu said colleagues valued Smith not only for his smarts, but also for his propensity to speak his mind. "He's so colorful," Wu said. "He tells you if you have a good idea or if you have a bad idea. People love him for his frankness." Smith -- who had previously served in Italy, Kuwait and Afghanistan -- was assigned to the 737th Explosive Ordnance Detachment, 52nd Ordnance Group, out of Fort Belvoir, Va. He was the 58th service member with ties to New Jersey killed in Iraq since the war began three years ago. A native of Punxsutawney, Pennsylvania, Sergeant First Class Scott Smith graduated from Jefferson Technical School and Punxsutawney Area High School in 1990. In January 1991, SFC Smith joined the Army where he would later serve in various locations stateside as well as Italy, Afghanistan, Kuwait, and Iraq. SFC Smith served five tours in Iraq, specializing in explosive and ordnance disposal. He was instrumental in the development and testing of new weapons systems and ordnance, including the Special Weapons Observation Remote reconnaissance Direct Action System (SWORDS) program. SFC Smith worked for five years at Picatinny Arsenal, a weapons research and development facility, where he assisted in developing methods to disarm spent weapons, as well as designing and testing robots capable of detecting bombs or of bearing weapons themselves. SFC Smith put his experience with robotics to use after the September 11, 2001, terrorist attacks. He and other soldiers from Picatinny, spent 10 days at the World Trade Center site, directing a small camera-mounted robot that assisted in the recovery of victims. SFC Smith was assigned to the Armament Research, Development and Engineering Center's Explosive Ordnance Disposal Team until February 2006. At the time of his final Iraq deployment, SFC Smith, was an explosive ordnance technician assigned to the 737th Explosive Ordnance Detachment, 52nd Ordnance Group, Fort Belvoir, Va. On July 17, 2006, while serving in Iraq in support of Operation Iraqi Freedom, SFC Smith lost his life when an improvised explosive device detonated during a controlled ordnance clearing mission. He was 34 years old. SFC Smith’s awards and medals include the Meritorious Service Medal, Army Commendation Medal, the Joint Service Achievement Medal, Army Achievement Medal, Army Superior Unit award, Army Good Conduct Medal, National Defense Service Medal, NCO Professional Development Ribbon, Army Service Ribbon, Overseas Service Ribbon, Outstanding Volunteer Service Medal, Iraqi Campaign Medal, Global War on Terrorism Expeditionary Medal, Global War on Terrorism Service Medal, and the Master Explosive Ordnance Disposal badge. ​It is with great pride that we name WCC’s Scotty in honor of United States Army Sergeant First Class Scott Smith. _PICATINNY ARSENAL, N.J. -- The Picatinny community paid special tribute to a fallen Picatinny Soldier when it dedicated a building and plaque to his memory during a ceremony here Tuesday. Nearly 100 friends, family members, Picatinny employees and guests gathered for the ceremony that renamed the facility formerly referred to as building 91 in honor of long-time Picatinny Soldier Sgt. 1st Class Scott R. Smith, who was killed in Iraq one year ago Tuesday. The building is now known as "The Smith Building" in his memory. The 65-year-old building houses the Armament Research, Development and Engineering Center's Explosive Ordnance Disposal Technology Directorate, where Smith worked for nearly six years. Armaments Engineering and Technology Center commander Col. Michael Smith explained during the ceremony why it was so fitting this particular building should be named after Sgt. 1st Class Smith. "This building named in his memory and honor will remind everyone who enters through its doors of the dedication, professionalism and bravery he exemplified," he said. "It is equally fitting that the building should house the particular profession that was his love (as well as) the brave men and women who, like him, belong to it," Smith continued. A law enforcement and Explosive Ordnance Disposal specialist, Smith was instrumental in the development and testing of new weapon systems and ordnance including the Army's first armed robot, the Special Weapons Observation Remote reconnaissance Direct Action System. Smith played a key role in the SWORDS program, by not only contributing ideas, but also by training Special Operation Forces on its use during a 2005 mission in Iraq. "While his involvement in that program has given Soldiers in harm's way a new capability with which to better defend themselves, few will know of his personal role in bringing SWORDS to the battlefield, except those of us here at Picatinny," Smith said. Throughout the ceremony, Smith's friends and family also had the opportunity to reflect Smith and his work. Master Sgt. Gregory Miller, a fellow EOD Soldier who worked with Smith, said Smith took the danger of the EOD mission in stride and never said no to the hard tasks - often volunteering for them. 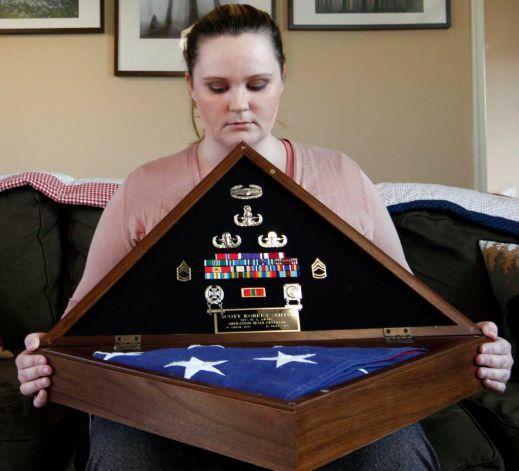 "He was a stand-up EOD technician and you couldn't ask for more," Miller said. Smith was assigned here to the Armament Research, Development and Engineering Center's Explosive Ordnance Disposal Team until February 2006. 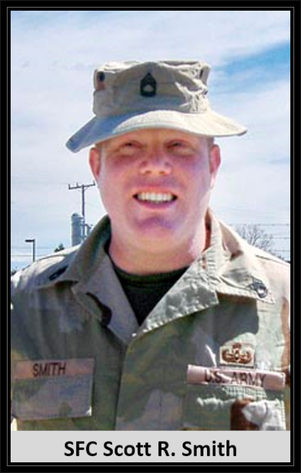 At the time of his final Iraq deployment, Smith, 34, was an explosive ordnance technician assigned to the 737th Explosive Ordnance Detachment, 52nd Ordnance Group, Fort Belvoir, Va.
On July 17, 2006, Smith died of injuries sustained in support of Operation Iraqi Freedom when an improvised explosive device detonated during a controlled ordnance clearing mission in Al Iskandariyah, Iraq. Previous to Picatinny, Smith served at Fort McClellan and Redstone Arsenal, Ala., Fort Richardson, Alaska, and Fort Lewis, Wash. He also served overseas in Vincenza, Italy, Kuwait, Afghanistan and Iraq. A native of Punsxutawney, Pa., Smith joined the Army in January 1991 after graduating from Jefferson Technical School and Punxsutawney Area High School the previous June. Smith is survived by his wife Gari-Lynn, a native of Tacoma, Wash., his parents Robert "Big Red" and Shirl Smith and brother Shawn and his wife Jen (Dupak) Smith, all of Punxsutawney. He is also survived by his paternal grandparents Richard and Betty Smith and maternal grandmother, Louise Vasbinder, also of Punxsutawney.